WELCOME TO HOTEL ROZKA KRVAVEC! 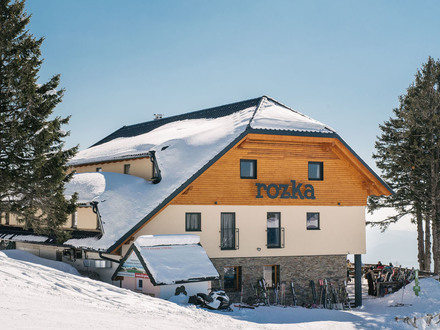 Hotel Rozka is located in the vicinity of the upper cable car station on the Gospinc plateau (Krvavec), at 1,491 meters above on the sea level, and only 10 meters from the slopes of Krvavec Mountain Ski Resort ski slopes. It features a restaurant designed in the alpine style, with a fireplace, and offers modern accommodation, Wi-Fi, and a large terrace overlooking the Ljubljana basin. The spacious accommodation has a panoramic view of the mountains; it’s equipped with light wooden furniture, satellite flat-screen TV and a bathroom with a bathtub, hairdryer and free toiletries. The surrounding area is popular all year round and offers numerous activities, such as skiing, hiking and biking. Bike Park offers 27 km of marked bike trails of various levels for all cyclists. Distance from the hotel: Ljubljana (Capital City) 44km; Jože Pučnik Airport 22km; Bled 55km, and Postojna Cave 92km. Hotel is accessible possible by cable car (working hours 8.00 – 17.00). Free parking is available at the lower cable car station.